Mezzaluna is a swimwear brand based out of Juhu which also sells its swimwear online. They offer customised swim wear for all body sizes as they believe their swimwear is all about promoting a body-positive image. Mezzaluna is a fashion label that caters specifically to swimwear, and they will customise every order according to your size and preferences. Not just that, they also cater to the plus-size body type so you can screw the awkward swimwear out there in market, and get a beautiful one made for yourself. Their philosophy is that everybody is beautiful, and everyone should embrace their body type and go out and own it. For this reason, Mezzaluna creates all sizes and will take in custom orders. Though they have ready wear swimwear collections, one can always get it customized. From bikinis to one pieces, and even kaftans for lounging on the beaches, they offer it all. 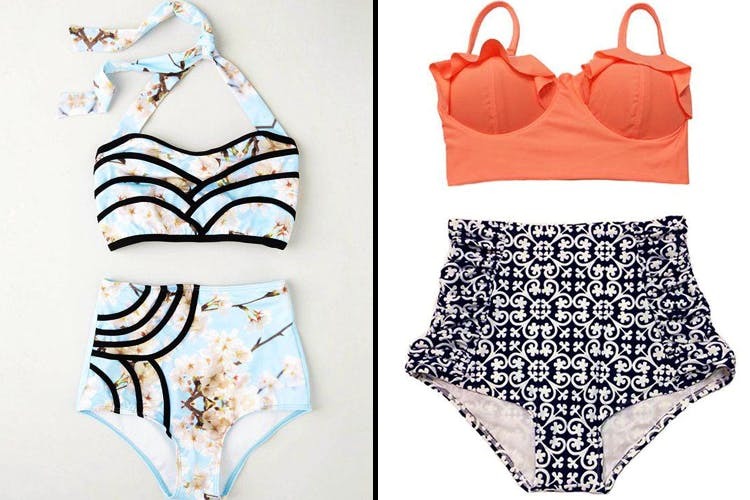 We are loving the body positive bikinis and swimwear as well. The pricing is high end, as the swimwear start at INR 3,500, however, as they are customised the pricing covers the tailor-made costs.